Are you looking for simple Halibut recipes that not only taste delicious but also look fabulous? Do you want to impress your family and friends with mouth watering food that’s quick to prepare? The Little Alaskan Halibut Cookbook features 36 simple halibut dishes that any home cook, can accomplish – all with LaDonna’s signature style that makes cooking easy and fun. You won’t need to shop all day for these recipes and most will take less than an hour to make. LaDonna shares recipes for the local favorites she encounters, including a refreshing Grilled Halibut Caesar Salad and Halibut Tacos. “ The ​Little Alaskan Halibut Cookbook​ is yet another extraordinary culinary and artistic addition to this Ketchikan couple’s outstanding body of work. 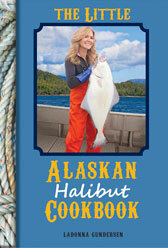 LaDonna’s recipes using Alaska’s favorite flatfish are creative, fun, easy to follow and absolutely delicious. ​Ole’s Alaska photos, as always, are a delightful addition, but his exquisite food photos are guaranteed to make you salivate. All the dishes look oh-so-tasty. Mmm, I can’t wait to try all of these recipes!”​ – Ray Troll, Soho Coho Art Gallery.